College & Money Savvy Wildcats. 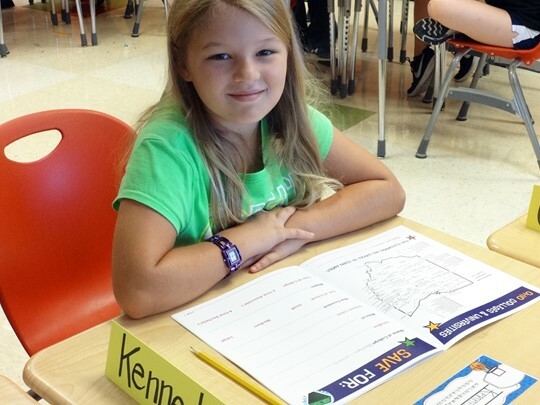 For nine weeks in the fall, specially designed lesson plans that revolve around the relationship between earning power and educational attainment are delivered in every fourth grade classroom. One portion of the curriculum emphasizes the four money management skills of save, invest, donate and spend. In addition, each classroom adopts a college and learns about not only that institution, but also other college vocabulary and information. The Piggy Bank Game. 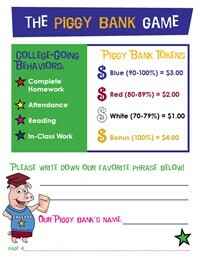 Each class is given a 4-slotted Piggy Bank and the students have the opportunity to earn tokens by exhibiting key college-going behaviors as a class. The game provides a hands-on, visual, and fun way to reinforce the curricular concepts of saving, investing, donating and spending. It also further emphasizes those school habits that lead to college attendance. At the end of the game, the tokens become actual money. The students are then given specific spending or donating options for which they can use their earnings. Ready 4 College Players. Early in the second semester, local actors perform an original script, "The Wonderful Wizard of College", written to reinforce the fall College & Money Savvy lesson plans. Six performances are scheduled at The Works, a local educational resource where in addition to seeing the play, each fourth grader will have the opportunity to explore this wonderful hands-on learning center for history, art and technology. 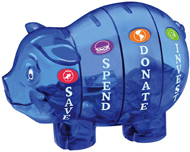 To play the Piggy Bank Game, each classroom is given a special 4-slotted pig, purchased from Money Savvy GenerationTM. Every classroom names their pig. Among our favorites: Blueberry, Chips, Pigzilla and Sir Bacon Waddles, Jr.
Edie Norlin, M.Ed., an education professor and Director of the Black Box Theatre at Ohio State Newark, and retired drama/art teacher, Dennis Kohler, penned the original script, "The Wonderful Wizard of College". Cast in the 2018-19 performance are Ohio State Newark students, Erin Hedrick, Jack Casey, Jessica Nincehelser and Mitchell Baughman (repeat performances by all four actors!). NCS Gifted Education teacher, Mary Borgia, will direct the play this year.